Udacity, the business Mooc platform valued at $1 billion, is pushing into blended online/campus learning — fresh evidence that a combined digital/physical approach is king. Udacity’s mix of bricks and clicks marks what many academic leaders, and edtech executives, see as the future of business education. The Silicon Valley edtech group is opening bricks-and-mortar study locations, starting with New York, Los Angeles, and California. 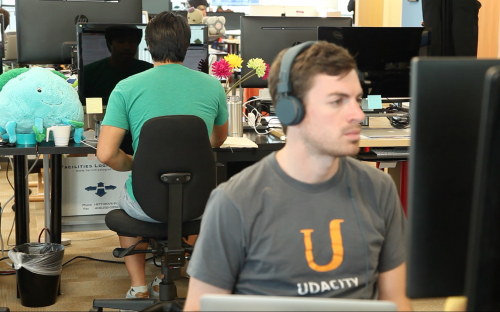 Sessions will be led by top Udacity graduates, who can earn up to $11,000 a month, Udacity estimates. Udacity’s “UConnect” scheme, priced at $100 per month, will provide the networking opportunities that many universities say is missing from purely-only courses. “Online programs today cannot offer the same level of networking opportunities that on-campus courses [do],” said Anne Trumbore, director of online learning at Wharton School, University of Pennsylvania. Shernaz Daver, Udacity’s chief marketing officer, said that, during a trial, blended students were more engaged with the program. “UConnect students had a 30% increase in project submissions and were three times more likely to complete their Nanodegree,” he said. Many top schools have embraced blended learning. Forced to innovate, some are running credible blended versions of their flagship MBA programs, such IE Business School, Warwick Business School, and Kelley School of Business. “Blended is an important approach because it allows us to provide flexibility, but to still have an intimate, high-touch environment where people get to know each other,” said William Lamb, dean of Babson College’s business school. Mooc platforms burst onto the scene a few years ago in barnstorming fashion, gathering millions of users, and promising wide-spread disruption of the traditional university model. But schools have fought back, embracing digital innovation and partnering with the disruptors. “Tapping technology to innovate in the classroom and create a unique, transformative educational experience for students is currently a challenge for ESADE and for most business schools,” said Josep Franch, dean of ESADE Business School. Udacity’s announcement marks the latest innovation among Mooc makers, which are increasingly moving beyond free courses with high drop-out rates and into paid-for, professional education. Udacity’s “Nanodegrees” are monetized. Coursera, a rival, runs “Specializations”, and charges users for certificates, and enrolment, to some courses. Online students are uploading certificates of competition to job sites like LinkedIn. And employers, such as Google, Amazon, and Adobe, are hiring them. “As more online degree recipients enter the workplace, and employers learn that many can perform as well as those with traditional degrees, the momentum to be more accepting of such programs grows,” said Patrick Mullane, executive director of HBX, Harvard Business School’s digital learning initiative. Educational leaders believe online learning is one way to close critical skills gaps, in areas such as data science and web development. In March, Coursera, the largest Mooc site, launched a master’s in data science with University of Illinois, which costs $20,000.